Have been experimenting with slumping moulds using stainless steel mesh which can easily be cut with tin snips and then shaped by hand. I used thin fire paper as a release and it allowed the texture of the mesh to show though on the slumped piece which I liked. I am over-whelmed by the words. 143 is a lot of people taking part. But I am disappointed too. I see people and think “I bet you didn’t do it. I wish you had’. I would have loved it if more people had taken part and felt that it was relevant to them. The negative words are fascinating. But sad that people chose this opportunity to have a go. Overall the project has been a success and a good learning experience in terms of what is possible to do and how to go about it. Working with Fiona has been one of the learning highlights for me. I feel that our project has been successful in terms of meeting its aim to discover what Tiree means to the people who live here. We have a view of some of them. Some of the words are beautiful, some are sad, some are miserable, some are mean. All of them are interesting, like the people that live here. All the word are on the blog tireewords.wordpress.com and this is where the story of Tiree in Your words will live on. How are we feeling now? In the run up to the event I am feeling exposed. What are we doing this anyway? (Possibly wouldn’t feel like this if it was a paid gig!) I think we printed too many cards. 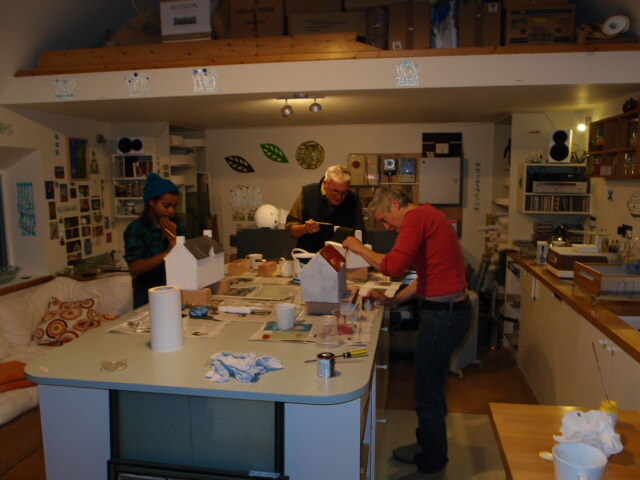 We held a box-making workshop on 29th October. Five folk turned out to help after a the-day-before notice on the Tiree facebay page. It was fun and many hands made light work. People enjoyed themselves so much they offered to return to paint the houses! There were options to make something a different shape or style from the house boxes but people opted to be directed and preferred to stick to the house style. Maybe as these were already part made. People enjoyed themselves so much they volunteered to return and paint the houses. They look beautiful and so do the cards. Was fun putting it all together. All of the 3 people who came to the initial conversation came along. We had prepared a ‘key points about the project sheet’, this included specifying that the project was the joint responsibility of Frnaces and Fiona and that Sophie and Sam were collaborating with us. we talked about incentives for the form filling but decided that the 'exchange' of participating and reading others words was enough. we will try and keep the project's profile up by word of mouth. need to get a dedicated sim card for the text line. All our decisions were made! We were ready to advertise our project in the Tiree newsletter An Tirisdeach. Phew!! what will happen to 'negative words'? Roxane is brilliant and left us feeling challenged and feeling the need to look at the project with fresh eyes. The main sense I was left with is that we are not really challenging ourselves do something different. We are using a familiar mechanism to collect information, through familiar channels using skills that we are comfortable with. Our main point of contact with people will be at arms length, through the ‘glove’ of a leaflet. To think about how the projects is explained and to have different levels of information available – a longer article in An Tirisdeach (the fortnightly Tiree Newsletter) may help this. To formally test the leaflet and how we explain the project to a group of people before the leaflet is finalised. Do they find it boring, difficult, easy, too abstract, too corporate? To ensure that the collaboration with Sam (and Sophie) is clearly defined. To be vigilant in making opportunities for engagement as the project evolves. To keep asking is the project meeting our aims? Being aware that we have chosen not to look at a social issue as such. To think about asking people if it is okay to display the tear off slips. Timescales may need to slip a little to allow us to respond to these points. Despite reservations about lack of focus and over ambition we remain excited by the project and feel that lack of focus allows a simplicity and openness that is a strength. Level social engagement we will achieve is unknown, but our plan includes actions for face-to-face contact and reaching people through others. Working with Sam, and implementing an idea that came from a conversation to get ideas! Considering the aspect of exchange. We are making progress against actions we agreed in the plan. Awareness of the limitations of our project due partly to time constraints and existing commitments. Fiona and I got together on 17th of October to talk about our project plan. We decided to run with Sam’s idea, from the public art convo, for a word project and we pooled our ideas into actions and dates to make it happen! Fiona wrote it up into a plan and after a bit more emailing we had a draft we were happy with. We discussed our personal interests. We didn’t discuss how we would work together, and any risks around this. For me it felt like we were flowing in terms of a shared vision and working through suggestions and decisions easily. In hindsight, we could have spent more time talking about how our different styles may cause us stress and on thinking about how could we reach as many different people as possible. The conversation went well. A big thanks to Sophie, Sam, Pat and Fiona for coming along. Sophie and Sam work as Youth Workers for the Tiree Trust and Pat is a voluntary Director. Fiona is a fellow student on the Art and Social Practice course. The group was positive about the idea of ‘something big made by Tiree people’. Something to visit. Something that spans the age barrier between parents and children. Something that blends old and new traditions. An Turas for display – could we change it? The Skate Park plans incorporating a giant something…. accordion? This last suggestion seemed to capture the group’s attention. Ideas for how the words could be used flowed. A book, audio, visual art? Some of the things I planned for were included. My plan helped me remember some pics of projects to help set a context. I was pleased that I managed to keep my gob shut quite a lot and provide a space for others to speak. Allowing pauses is effective. The glass making went smoothly. The making was with no direction on content apart from each person having a smaller piece of a bigger thing. I think this was okay given time constraints and caution of some participants. But was a bit of a cop out too. The process may have benefited from more direction, like some of the ideas discussed in the plan, to try to create a piece with ‘meaning’. 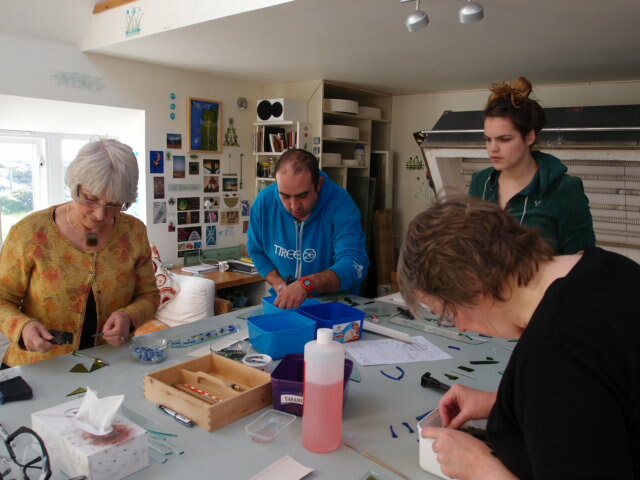 Everyone learned to cut glass and overall it was a good ‘taster’ with some experimentation thrown in. It might have been good to go outside for 2 mins before we got into the making – or to have sent them and I could have got more prepared. But mainly to give a sense of stillness before starting to make. I am planning to hold a conversation around public art with staff and a director from Tiree Trust, so am thinking around the subject. Why does public art interest me? I would like to work with people to create something with meaning that they are proud of. (And is beautiful and maybe functional). What do I want to get out of conversation? Practicing skills eg listening, openness to ideas, recording, contributing clearly and succinctly, providing a framework that invites participation and provides openness and clarity. brainstorming - ideas where this could happen on Tiree and who with? Not much time so something simple. Something that represents or reflects on what you bring to the Trust, what you find have gained, has it changed how you view Tiree? Suggest it is joint piece but can be individual elements of a triptych. If its a three they should hang together somewhere 'public'. I would like you to be responsible for deciding the theme of the piece. I would like you to sketch for 2 mins. Then come back to me to help out with next stage. I went along to Fiona's conversation on Saturday 5th Oct. Prior to the meeting Fiona gave us two tasks; to bring along something we would like to talk about, and something we would like to give away. The format worked. Fiona has good skills in allowing the conversation to have its own life, while gently leading us. The conversation flowed around the new bus stop. Is it useful? And the butchers closing. Thoughts on how information is transferred on Tiree and that some people feel that a distinction between incomer and local is relevant. I got to know the other participants better. My topic was 'is there a visual tradition on Tiree?' and I was intrigued by the responses: the houses, the unique light, the lack of shadows, the flatness, the 'Tiree colours', imprints of waving patterns, cupmarks and hares. But not a tradition of visual making perhaps. At the end Fiona gave us five questions to reflect upon, and asked us to return our comments to her if we wished. The questions included 'what did you expect?'. This made me realise that I hadn't considered what to expect. Only thinking that I would enjoy it and would be stimulated. A reflection for me was that I might come across as quite forceful in the conversation that might be off putting for others. My natural tendency seems to be to be to find clarity in my thoughts by articulating them. The result may sound judgmental and fixed, so preventing others from contributing. Maybe if I had thought about my expectations for the conversation, I could have guarded against this tendency and so learned more from others. Next time! Went off to Oban for the night to see the wonderful and moving play about the life of Angus MacPhee from Uist. Catch it if you can! The four hours each way boat journey gave me the chance to read Pablo Helguera's Education for Socially Engaged Art. The book is very readable and I found it useful to have some clear definitions and 'dos' and 'don'ts' to think about. hanging out with like-minded people. I love being provided with a framework in which to act. The brief to think about a formal aspect of exchange has helped me to plan my next conversation. I will base it around public art and introduce an element of making. Which I hope the participants will feel rewarded by doing, and get something to take away. I hope the conversation will help me to develop skills in listening, openness to others ideas and contributing clearly. The other element we will be introducing is recording. This led me to remember facilitation techniques I came across when working in environmental education 'Open Space Technology' is one I will look up. There must be lots of parallels to the techniques that we are developing in this course and disciplines such as community development, environmental education. Is there a distinction that makes the techniques we are learning unique to the art arena? I love filling my kiln. The freshly batwashed kiln shelves are my blank canvas. Anything is possible. And then the painstaking slog begins with sporadic flashes of inspiration. Lots of bombay sapphire bottle glass this time for a couple of mirror frames for the gallery and some swirly things from the big 4mm float window glass from a Tiree house renovation. I sing a bit with The Defenders - a fabulous noisy rock band and a Tiree institution. The current lineup has members from the original decade-old line up and two newbies, Bernie on drums and me on backing vocals. We have played 4 gigs so far this summer and the issue of 'should get paid for gigs' was raised. It was good to have the a chance for a slightly more formal chat than usual. Fiona is thinking about a wind festival. Cool! A benefit of an art project in small community is that it allows space for differences and individuality to be expressed so allows appreciation of others views. the importance of the intention in setting up discussions like this. I am taking a module with the University of the Highlands and Islands called Art and Social Practice. The course is based in Shetland as part of a BA in Contemporary Textiles and I am taking part with another local artist, Fiona Dix. Today is the third week. We connect with other people based in Shetland and Moray via video conference at Tiree's business centre. No worries about living on an Island if you want to do stuff! the importance of the 'product' or art piece vs the participants experience. If these things can be agreed and understood at the outset, whilst building in a degree of uncertainty, the chances of a successful project will increase. Our first session was inspiring, raising all these thoughts with fascinating websites and video clips to wet our appetites along with meeting the other participants. Five in Morayshire, 8 in Shetland and us 2 on Tiree made for an action packed 90 mins.